The six National Outdoor Badges badges of the award recognize a Boy Scout, Sea Scout, or Venturer who demonstrates both knowledge and experience in camping, aquatics, conservation, hiking, riding, or adventure. Scouts Youth earning the National Outdoor badges have demonstrated that they are knowledgeable, safe, and comfortable in the outdoor activity covered by the badge. Outdoor activities completed as part of any BSA program (Cub Scouting, Scouts BSA, Sea Scouting, Venturing, or Exploring) may be used to satisfy the requirements of the National Outdoor Awards so long as conducted as part of an approved unit, district, or council program. This is referred to as "under the auspices and standards of the Boy Scouts of America" In the requirements. 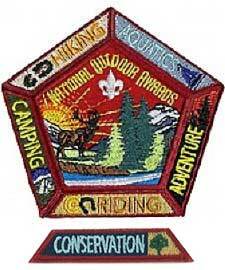 National Outdoor badges may be earned in the following areas. Earn the Boy Scout Scouts BSA First Class rank, Sea Scout Apprentice rank, or complete Venturing Ranger Award requirements 1–6. Complete 25 days and nights of camping—(Sea Scouts may be on a boat), including six consecutive days (five nights) of camping (Sea Scouts may be on a boat), approved and under the auspices and standards of the Boy Scouts of America—including nights camped as part of requirements 1 through 3 above. Boy Scouts Youth must complete six consecutive days (five nights) of the 25 nights at a BSA accredited resident camp. Earn the Boy Scout Scouts BSA First Class rank, Sea Scout Apprentice rank, or complete Venturing Ranger Award requirements 1-6. Complete the requirements for the Swimming and Lifesaving merit badges. merit badge and either Lifesaving merit badge or Venturing Ranger Lifesaving elective. (For Sea Scouts, Swimming merit badge requirements are an Ordinary rank requirement, and Lifesaving merit badge requirements are an Able rank requirement). Earn Complete the requirements for the Mile Swim BSA Award. Complete the requirements for at least one of the following merit badges: Canoeing, Fishing, Fly-Fishing, Kayaking, Rowing, Scuba Diving, mall Boat Sailing, Water Sports, or Whitewater merit badges or Ranger Award Fishing, Scuba or Watercraft electives. Complete at least 25 hours of on-the-water time, applying the skills that you learned in the merit badges badge or Ranger elective. Demonstrate the safe use of five of the following conservation tools: pick or pick axe pickax; shovel or spade; ax; bow saw; cross-cut saw; prybar; sledge hammer; loppers or shears; fire rake or McLeod; and/or Pulaski. Discuss the ethical use of the tools you chose.